Following up on last week’s conversation about inspiration: I was extremely pleased with some of the works seen by students for student diary entries as well as the GUI workshop. It is good to see that you are being inspired by works that I introduced in class and that you take feedback on board. It is important to question your work, to seek feedback and to refine it. It is never easy to produce work that will satisfy your own standard. You are actually lucky if you set a high standard for yourself, I often teach students who do not set a high standard and therefore just aim for mediocrity. Their work is generic and looks like something they have found on Google. You want to aim to first understand a question.You can do this by looking at the design problem and creating a clear project outline, including a design brief, a close look at the target audience and the overall technical details. Next you look at providing an answer, that suits the brief and that covers all the points of the project outline. If the answer reflects your style or has your signature, that is an added bonus. It looks at retro style illustrations and I appreciate the amount of texture and depth that can be found in a lot of the works. Below are illustrations by Gary Neill. His illustrations are rich in texture and show depth in the use of colour, tone and pattern. All his works are simple in shape and visually engaging. I like to look at his work, it makes me feel something, may this be happiness or a sense of wanting to explore the work in more detail. The orange and blue illustration is such a strong statement, it makes me think of online chatting, online dating or any form of digital interaction. The illustration below is a more sinister and serious work by Neill. It was used by The Economist and has a focus on torture applied by a government. We have all heard the saying an image says a thousand words and this illustration is a powerful attempt at raising awareness of torture happening nowadays and how different Western countries view it. I like the simplicity of the image and the use of only black and red. Red is always a strong colour to represent emotion and it is used here symbolic for blood. This is a link to the article The Dark Pursuit of the Truth – Spies, Torture and Terrorism. The illustrations below are works by Tavis Coburn. His works look very retro and represent a style and feel often found in book cover illustrations and comics of the 1940s and 50s. The style is often referred to as Pulp Fiction – see this Google link for examples for Pulp Fiction book covers. I find his work very appealing, the stylised use of halftone patterns can look cool – even though it has been overused in recent years. The image of the newly-weds has depth – the back ground is blue and white and mostly flat (except of a few scratch marks above her head), the couple are very textured in an over exposed halftone pattern, the dotted line and suitcase with money sit above it all and suggest that the bride is focusing on the money. The work is a dynamic play on figure/ground relation or negative and positive space. The second illustration by Coburn is from an article predicting the future of iOS in 2011. What appeals to me is the bright colour scheme, the icons representing the infographic nature of mobile app design. Yet, the image looks like a SciFi take from the 1940s or 50s if not even earlier. I feel reminded of Fritz Lang’s Metropolis. Again, it seems that Coburn looks at our time through a mirror of the past. The illustrations by Jessie Ford have an appealing softness to them. Her work is retro and yet very contemporary. Her work looks very vector-based, it is rich in overlaying textures. I like how she uses dirty looking textures to add to an otherwise plain background. Her generous use of white space and rich textures with her vector graphic or stamped shapes is very attractive. It has depth and I always feel like looking at her work longer and a second time to see what it actually is. The second illustration has that simple texture that I described as dirt above. It is like rolling a drying roller brush with black paint over a rendered wall. The texture that she has applied to her illustration makes it more interesting and gives it depth. Without it it would look more digital and clean, maybe flat and polished. The grittier look of her work is strong. This tutorial was listed in previous classes and will be presented today. It is a Photoshop tutorial that shows several easy to follow steps that will allow you to create the illusion of a glossy finish and reflections. This is very suitable for creating a glossy interface, buttons or logo, as well as adding a fold line to your work to make it look more realistic (as if scanned of a poster). I suggest some alternative shortcuts to the steps used in the tutorial by Tutorial9. Follow the in-class presentation of this tutorial The 5 Essential Photoshop Reflections or complete it yourself. Upload the PSD file for the tutorial or use a PSD of your choice. You will need a basic button against a dark background. 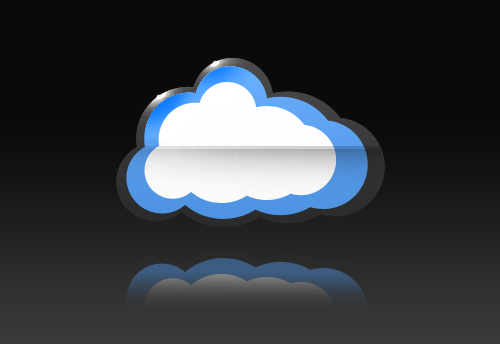 Select Group 2, the layer with the cloud in it. Duplicate the layer by pressing Ctrl+J (Cmd+J). Press Ctrl+T (Cmd+T) to activate Free Transform. Right click on the selected cloud and select Flip Vertical. The cloud will have flipped over. 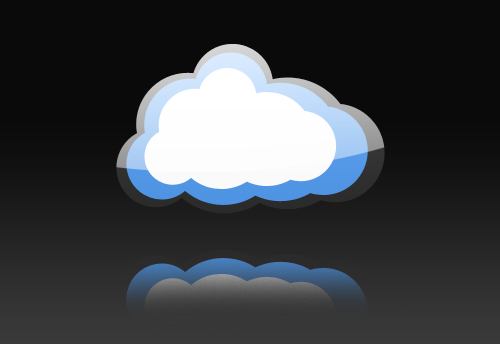 Drag the cloud down manually while holding shift (to keep it aligned) or use your arrow keys (with shift – to go in larger steps) to move the cloud down. Complete the Free Transform by pressing Enter or double clicking on the cloud. Activate the gradient tool (press G) and drag (while still in the mask mode – the mask needs to be outlined) from point 1 to point 2 (see image 2). Your reflection should be partly invisible. Last steps: apply the layer mask(right click on the layer text and select apply layer mask) and change the layer opacity to suit (I chose 65%). The Environmental Reflection is white on top and gets lighter towards the bottom. 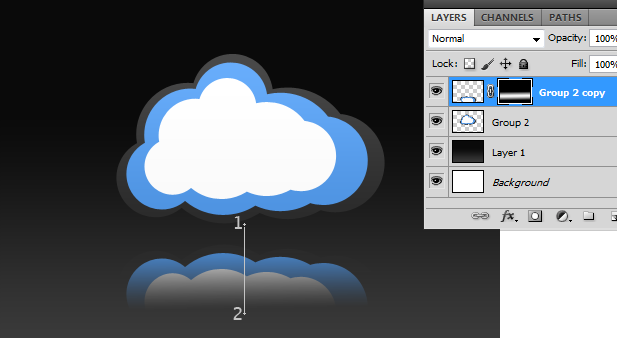 Select the cloud on the layer Group 2. The fastest way is to hold Ctrl while you click the layer thumbnail. Make a round selection with the Elliptical Marquee Tool (Shortcut: M or Shift+M to toggle between Rectangular and Elliptical Marquee) and drag it over the top part of the selection of the cloud. Make sure to hold Shift+Alt (or pressing the Intersect with Selection button in the options panel) while dragging your round selection. The result should be a top part selection of the cloud with a arch at the bottom. 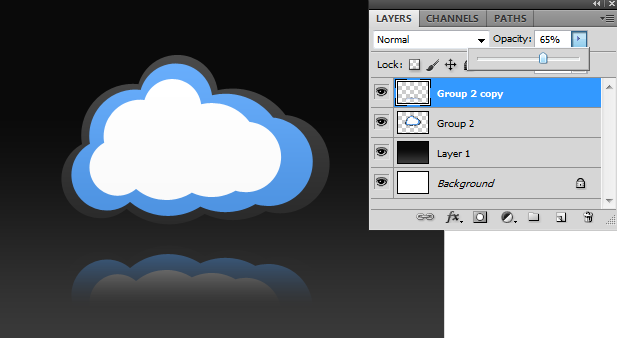 Create a new layer on top of the cloud layer (Group 2). Call it Env Reflection. Make sure to have white as foreground colour. Fill the new layer with a white to transparent gradient. Select Gradient Tool (Shortcut: G) and choose the option: Foreground to Transparent (in options panel). Drag the cursor from above towards the selection. This will apply the white. Try it a few times until happy. Reduce the Opacity setting in the Layers Panel to reduce the intensity of the gradient. Save your file for the Web: as a PNG. Do everything as in the steps for the Environmental Reflection, except: call the layer Glossy Reflection and apply the gradient fill from the bottom up. 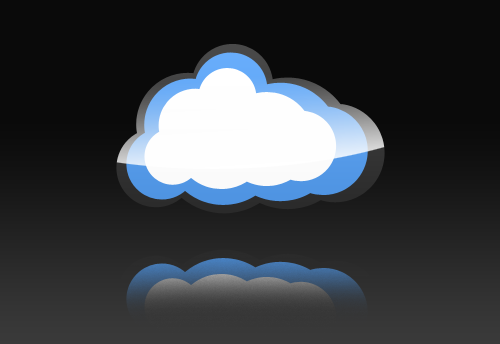 This will make the cloud shape look like a glossy object. The Fold line is doubled up and the flare gives it a bit of depth. Look at the Tutorial9 link for the flare. The fold line is a good way to create the illusion that your artwork is a poster that has been scanned in. The illusion of the fold looks like the shade in a photo or worn. Make a straight selection with the Rectangular Marquee Tool (Shortcut: M or Shift+M to toggle between Rectangular and Elliptical Marquee) and drag it over the lower half of the selection of the cloud. Make sure to hold Shift+Alt (or pressing the Intersect with Selection button in the options panel) while dragging your selection. The result should be a lower half selection of the cloud. 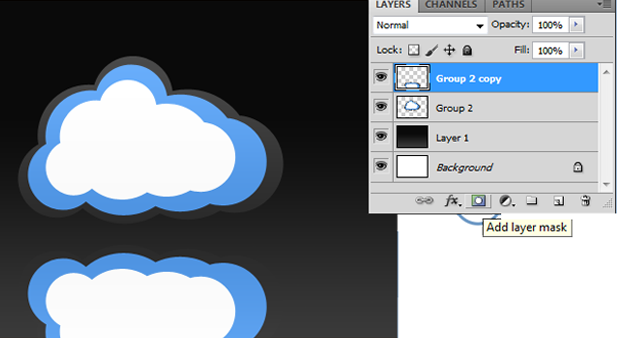 Create a new layer on top of the cloud layer (Group 2). Call it Fold Line. Make sure to have black as foreground colour (or simply press D). Select the Brush Tool (Shortcut: B) and a size of 170 or more with a hardness of 0% (this can be found in the Options Panel under the brush tip (called brush preset picker). The next bit is important: Do NOT draw inside your selection but a bit above it. The thickness and softness of the brush will still provide a hint of black. Reduce the Opacity setting in the Layers Panel to reduce the intensity of the colour. Copy and move that layer to get a more natural and slightly overlapping or blurred fold. I hope that you have enjoyed the tutorial. Please leave me your feedback in form of a comment. If the tutorial did not make sense to you, I would like to find out about that, so that it can be made clearer. Thanks! Please open your assessment 1 – Student Diary Cover; I will walk around and look at everyone’s progress. Please open up anything you have done. I would like to see some ideas and concepts at this stage, a description of the target audience and possibly you might have started on the project in Photoshop, Illustrator or InDesign. I will spend approximately 20 mins on this. This assessment covers this class for these units: Create Visual Design Components and Analyse Information and Assign Meta-Tags and Create A User Interface. 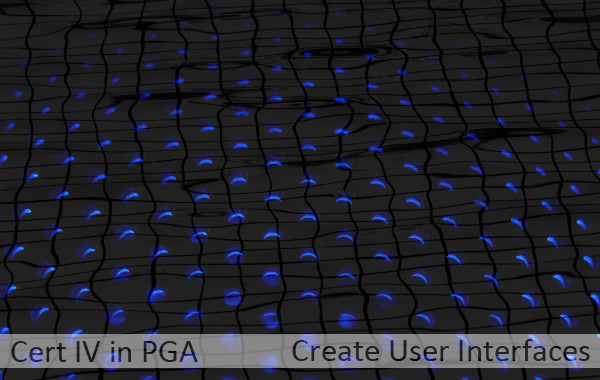 Design a Graphic User Interface. You can choose to design for a Website or App. First: think about a project. What do you want the GUI to be for? Think about a client scenario, who is your client and what is the purpose of the site or app? What do you want the user to do after visiting it? 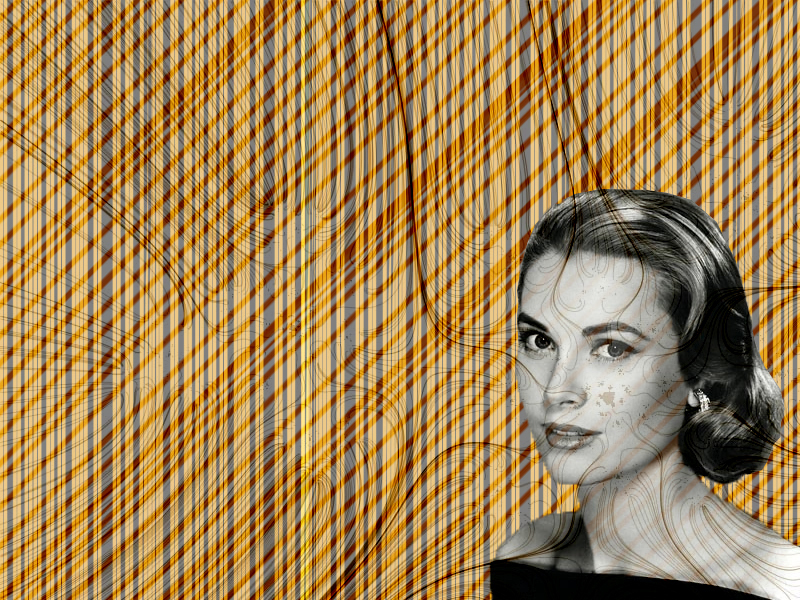 Develop sketches and refine your design in Photoshop. Dimensions – at what size will the user view your GUI? Target Audience – Visit class 3 for ‘Visual Design Components’ for ideas on how to develop your target audience. Influences – ‘screenshot after screenshot’, capture screenshots of influences, look up sites that influenced you. You will need to supply original photos taken by you! Each photo needs meta-data assigned to it. Include photographer details, tags, image title, copyright statement. Include a folder with the edited images with meta-data.